Now that you’ve got your blog up and running with new articles and valuable information for your readers, you need to offer your audience even more high value content. And I’m not talking about simply hitting them with more and more blog posts. Instead, you can keep providing that high value content with a lead magnet. This is an incredibly simple concept, yet such a valuable strategy for building up your traffic and effectively turning your cold visitors into red-hot customers. A lead magnet is simply a piece of valuable content in exchange of a visitor’s contact information. Offering a lead magnet is much more effective than a simple “Subscribe to my Blog” button or a “Sign up for my Newsletter” call to action. 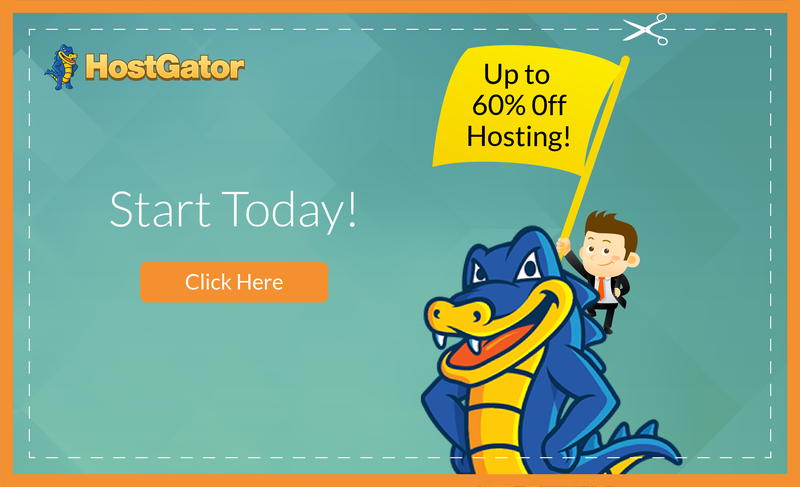 With this strategy, you’ll entice your visitors to willingly provide their email address in exchange for something of high value.. all for free! Here’s the thing.. This list of email addresses is an absolute must in today’s world of online business. The sooner you’re able to build a list of emails, the sooner and more powerful your sales funnel will become. Note: We’ll revisit exactly what we’re hoping to do with this list in our next step. For now, we’ll need to start building our list. You may have seen offers like these all over the internet.. This is technically a lead magnet. 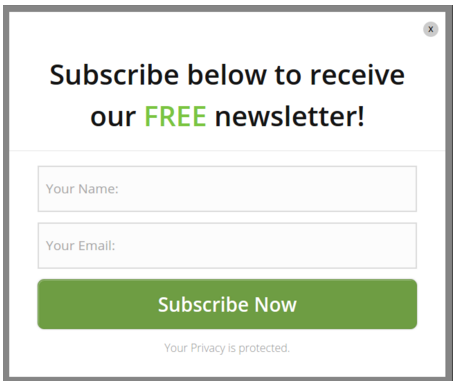 However signing up for a free newsletter or subscribing to a blog essentially means one thing in today’s world online. It means you can expect a ton of emails! Although you, as an online business owner may see this offer as something valuable, most people generally don’t want to increase the amount of emails to their inbox. Rather, a much more effective lead magnet offer is to include some piece of value in exchange for their contact information. See this as a quick example from QuickSprout. Now this offer delivers incredible value! 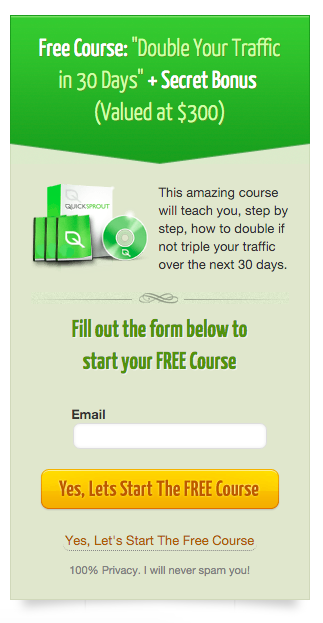 In exchange for your email address, you will receive a FREE 30 day course to help double your traffic. Who wouldn’t want that? 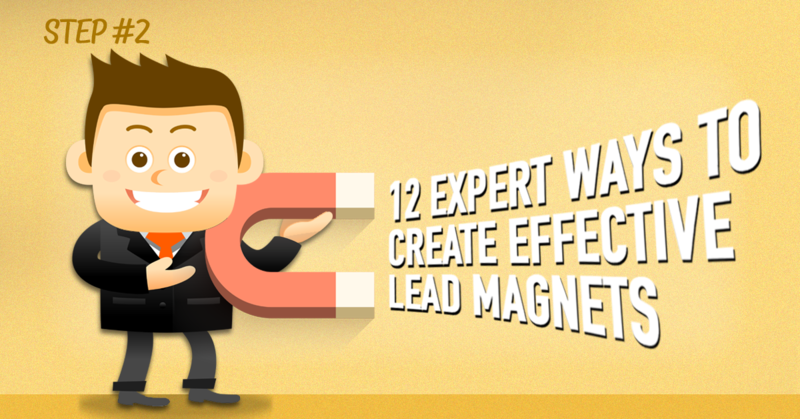 Now that you’ve got the idea, we’re going to dive into 12 different ways you can create a lead magnet. Before we touch on each type of offer, it’s important to get a few things understood first. It’s important to understand what your audience may gravitate toward. The stronger your understanding of what type of content your audience likes, the better you’ll be able to provide a relevant offer for their highest benefit. If you already have an archive of articles, you can check to see which ones are the most popular using Google Analytics. Simply head to Behavior > Site Content > All Pages. Then see which posts/pages are the most popular. You can take note of the ones that have received the highest level of traffic by viewing their “Pageviews”. For more on this step, check out our post on Repurposing Old Content to give you some added ideas. Also, if you’re fairly new to Google Analytics, we cover all the basics over on our video tutorial, here. Additionally, if there are any posts in your top 5 or 10 that cover a similar category or topic, consider providing valuable content surrounding this topic as a starting point. Your offer should be ultra specific and straight to the point. Your audience member is hoping to achieve a desired goal using your specific information. So, provide valuable information that can help them reach their goals quicker and easier. Your audience should not find your offer too complicated or time consuming. It should be presented in a very simple and clear way. This way your audience will be able to reach their desired end goal faster and have an enjoyable experience while doing so. Make it like a relieving breath of fresh air for your visitor. Your lead magnet offer should also be simple for you to create. It should not take you a long time to crate your offer. 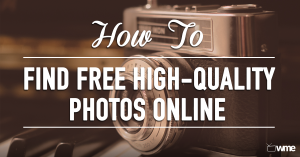 Yet, you will definitely want it to be high quality. So if you’ve got all your content written, but you need help creating your actual lead magnet, you should check out services like Fiverr or Upwork as a great place to start. Now that you’ve got your topic, let’s take a look at our list that details 12 highly effective types of offers for you to easily create and offer your audience in no time. This first approach is one of the simplest ways to provide a lead magnet for your audience. You may think this sounds over-simplified, but often times people enjoy being able to print out and hold your article standing on its own. There are a number of reasons as to why one would prefer this format. If they have your article saved on file or saved in an email, they would be better able to refer back to it over searching through the internet for that specific article again. And for some, searching through all their bookmarks in their web browser may be a daunting task. Another great use for a PDF download could be to outline one of your longer articles. These could be extremely helpful to enforce points in your original post or to supplement the post and make it more readable. Tip: Try creating your lead magnet in Microsoft Word or Powerpoint. Simply copy and paste elements of your article on each page and add some basic styling. 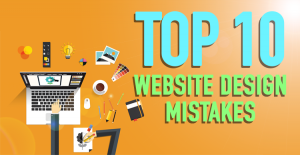 Be sure to include your logo and website URL. Then select, “Save As” and save it as a PDF. 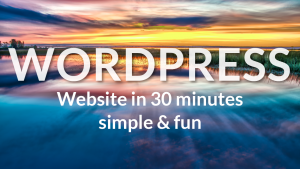 Then, upload this .pdf file to your Media Library in your WordPress dashboard. You can then insert an “Opt-in” form or contact form directly into your post that contains your PDF download. If you find yourself stuck right here, don’t worry! We cover more on exactly how to do this in our next article! A checklist or a cheatsheet puts a ton of needed information simply and clearly all in one place. This offer may be perfect for beginners or even the most advanced members of your audience to make sure they have their i’s dotted and t’s crossed. For example, if your blog is about traveling around the world, consider offering a full pre-departure checklist to make sure you’ve remembered to pack everything. If your business is an animal clinic, try offering a cheatsheet of all the common household pet poisons. These ought to be clean and simple and able to be printed out for your audience to be able to hold, write on, hang on their fridge, or even take with them wherever they go! 3. Swipe File, templates, scripts, etc. A swipe file acts as a collection of proven copy, scripts, templates, verbiage, formats, etc. that you audience can copy and paste for their own use. They should all be easily adaptable from your business to theirs. For example, nearly every online business needs to come up with some sort of content. These articles need to have effective headlines in order to grab attention. However, choosing just the right headline can be rather difficult for many. Therefore, we put together our 78 Top Performing Headlines in a downloadable swipe file. You are able to download our lead magnet and use these successful headlines for your own online content writing. You can offer a swipe file, script, or list of templates for nearly anything. If you have successful email sequences or sales decks, offer these for download as a script and template for your visitor to benefit from. Encourage them to take your template and make it their own. You can make it even easier for your visitor by creating highlighted fill in the blank areas for them to write in their own information! You’ve probably seen free trial offers everywhere! And it’s for good reason. They’re extremely effective. If you have a membership site of sorts, try creating a new membership for your site that’s good for 7 days or 30 days, etc. all for free. 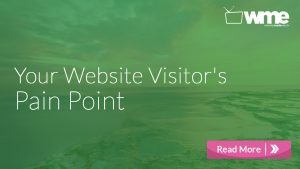 This strategy stands apart from all the others in that you are in effect leading your visitor directly toward a point of purchase. You are also encouraging your visitor to try your product first-hand. They can jump in headfirst and get to know your service personally. You will then have the opportunity to give them an option for continuing with your service for the full membership price. This may prove highly effective for you and your audience. You may also consider offering a free version of your membership indefinitely with options for upgrading to the added paid capabilities at anytime. This strategy is referred to as “Freemium”. You will often see this strategy in apps on a smart phone as well as a number of services online. Providing an email address in exchange for a coupon code is a no brainer for most website visitors. I’m personally subscribed to a number of services’ emails that I know offer a coupon almost every week. Without fail, I get offered a free or 75% off discount to Redbox every week and half-off a Papa Johns Pizza straight to my phone! You can offer all kinds of coupons to your visitors via email and keep providing value in an ongoing way from one simple sign up. Likewise, you can also offer free shipping coupons on certain items or certain orders above $50.00, for example. You may have seen this on a number of online retailers’ websites. This strategy, however, must consider the actual dollar amount for shipping. Your customer acquisition cost could be very high with this strategy. However, if you’ve done the math and it looks good, go for it! A report or case study is essentially an in-depth look at a particular topic down to the nitty-gritty specifics. It sets the expectation that there will be a process detailed with specific examples. Whether these numbers are from real companies or businesses, real customers, or real customer data, the case study will act as a tell-all. These are very valuable to visitors as they often demonstrate an entire process with real numbers and real results. The downside, however, of creating a report or case study is that they often take time to create and present. There must be an actual trial period, tests done, and data collected. You ought to also present your findings with real data and plenty of imagery to support your points. We’ve found that these types of lead magnets have done very well for our audience. There are nearly unlimited types and styles of e-books and guides out there. However, one thing we’ve seen as a unique strategy is to explain how to do something specific. This type of how-to eBook should list all steps necessary to complete a particular project with a specific end goal in mind. That way, you know you’re providing a valuable solution to a common problem. A webinar is essentially an online live seminar. 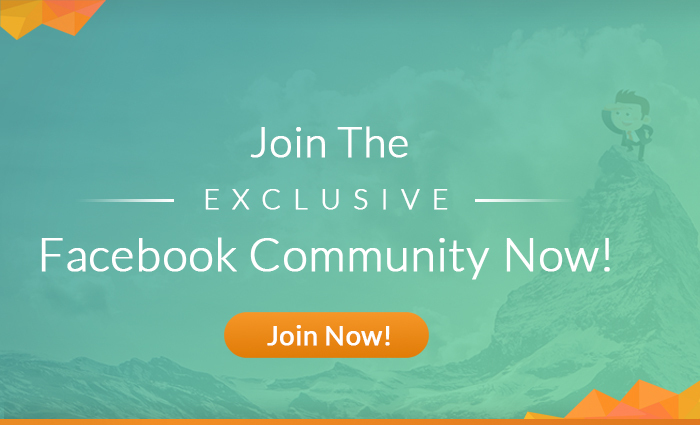 You send invitations for everyone to join in on a single page where you, the presenter, covers an interesting and valuable topic live from your computer to your audience or attendees on their computers. You can cover just about any topic with a webinar, but you will likely present your information with slides, examples, demonstrations and an open chat forum. Your audience will benefit from such a real and raw insight, but what’s more valuable is the live demonstration from the presenter’s own computer. These do take a lot of effort, however, but could pay off well as you’re able to offer high value information and lead your audience toward a top tier product. If you’re hoping to sell big ticket items, a webinar is especially useful for you. This is because a webinar is one of the highest value offer you can make. However, this doesn’t necessarily mean that your audience will have a higher engagement rate than a simple PDF download. It’s up to you to get a pulse on your audience and test out all the different types of offers. A toolbox is simply a list of resources in a sort of over-the-shoulder in-depth view of the exact tools you use to be successful in your own business. You’ve already done the work and have your own process outlined. Why not share your hard work with others to benefit from? 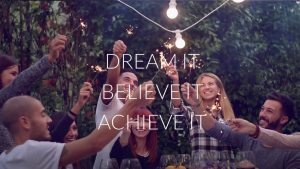 You don’t necessarily have to give away the secret recipe, yet you can still give away a whole lot of insight into your success as a business for others to benefit from as well. Transcripts can be very helpful for a variety of reasons. They provide a clear summary of a large topic. They enable the audience member to refer back to a particular section without getting confused and lost having to continually forward or rewind. Transcripts of interviews can be incredibly helpful for all these reasons. We’ve also seen transcripts of a podcast as being incredibly helpful for visitors. They provide their audience with show notes, all the helpful links, and a visual progression of the podcast. Note: If you have videos or audio files that you want transcribed, rather than sitting through it and typing it all up, you can use a popular service such as Fiverr. Fiverr connects you with all sorts of freelance work, but their transcribers are extremely helpful and inexpensive if you don’t want to take the time to write out one of your hour-long podcasts. Definitely be sure to check this service out. You may be surprised to find that an audio download can be incredibly valuable to a large chunk of your audience. An audio file of one of your long articles or eBooks can be very valuable to many. The best part is, they can be created rather inexpensively. This type of download can be utilized by someone who runs a podcast, for example. They can try offering a download of a particular session as a free lead magnet. A mini course or email series may take a bit to set up, but it may enable you to guide your new visitor down a very specific path. This type of lead magnet is unique in that it allows you to remain top of mind for a period of time. Remember we had mentioned to be quick, clear and straight to the point in providing a valuable solution to your audience’s problem? This strategy, in effect, achieves this point in small pieces over a short period of time such as 3 days or one week. Throughout the series however, it’s important to point your audience in the direction of other valuable resources. While they wait for their next email, they have relevant resources to help them with their current step. Try subscribing to other mini courses and see how effective they are on you! Be sure to make notes of what you liked and what you didn’t and incorporate your takeaways into your own series! 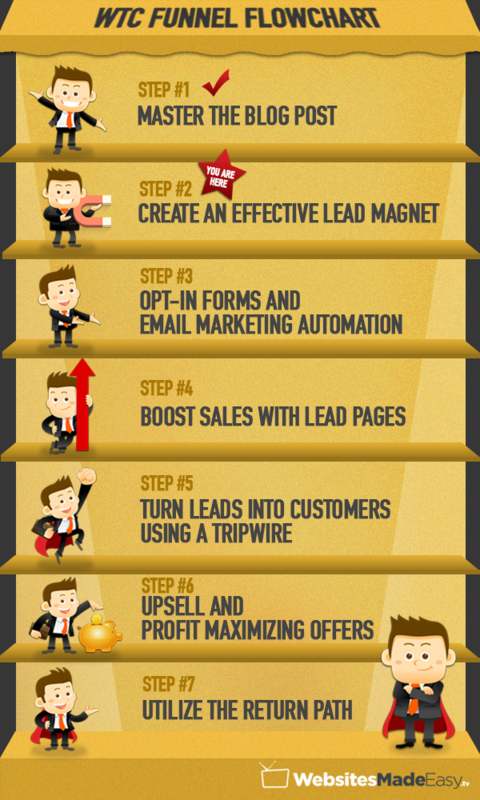 Ready to create your first lead magnet? Even if it’s simply saving a word doc with some text as a PDF, there are tons of ways to create a lead magnet as you’ve seen here. For now, we’ll go with our first example and create a simple PDF lead magnet to get you started! And honestly, this doesn’t need to be difficult. So, don’t get hung up on this step as even some of the pros out there don’t have the prettiest lead magnets in the world. Seriously, all you need is a simple word doc saved as a PDF. That’s it! Yet, we still want to be intentional with what we choose to present as a lead magnet as it’s got to be incredibly valuable. This is your chance to make a fantastic impression on your new audience member. After all, this may be the only chance you’ve got to win the hearts of your new audience member. We better make it count. 1. Take one of your existing pieces of content and drop it into a Word doc. If you’ve written an article, blogged about a certain topic, wrote a review of a product you use, or just about any other piece of written content, take this copy and drop it into a word doc. Hint: you may have created the initial piece of content in a word doc to begin with. Just use this final edited copy. Change the size of your headings. Congratulations! You’ve now got yourself a nice little document to work with! Hit “Save as..” Select the format, “PDF” and boom! You’ve got yourself a lead magnet! Which lead magnet do you hope to create first for your website? What kind of lead magnet have you seen working well online now? Drop us a comment in the section below and tell us what you think! I saw your Udemy lectures. They were quite impressive. What animation and graphics tools/software did you use for creating the videos and the images?